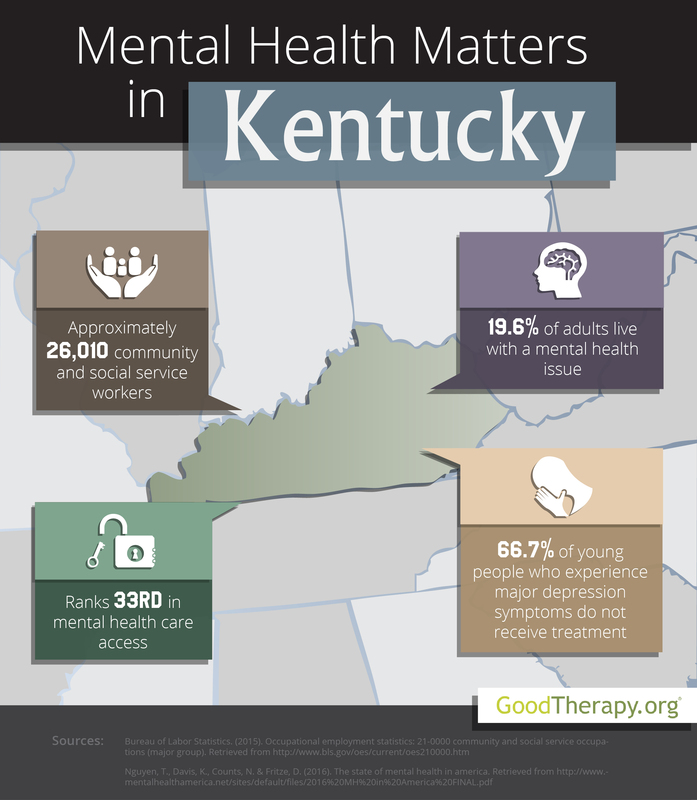 Find a therapist in Kentucky with GoodTherapy.org. Data from the U.S. Census Bureau shows approximately 4.4 million people lived in the state of Kentucky in 2015. Of this total, nearly 23% of residents were under age 18, and nearly 15% of residents were 65 years of age or older. Female residents accounted for 50.8% of the state population. The Bureau of Labor Statistics contends 26,010 residents worked in social and community service fields in 2015. Occupations within this sector included working as care providers at residential treatment centers, therapists at rehabilitation centers, health educators, some types of officers working in corrections, depression therapists, religious workers, clinical social workers, and marriage and family therapists. In Kentucky, people in these professions earn, on average, $40,360 each year. Kentucky received an overall rank of 21st for mental health standards within the state in the 2016 State of Mental Health in America survey. This overall ranking was obtained after all U.S. states and the District of Columbia were evaluated for current mental health conditions and access to care by Mental Health America (MHA). In the survey, Kentucky was 12th in youth ranking, 36th in adult ranking, 12th in ranking for prevalence, and 33rd in access to mental health services. These numbers show a low rate of mental health conditions and high access to mental health services for young people, but a higher prevalence of mental health conditions and lower access to care for adults. The 2016 MHA study indicates about 5% of adolescents in Kentucky experience severe depression symptoms; the state was 7th in this category, indicating a low rate of depression. Mental health researchers have identified a correlation between this ranking and the low rates of violent crime in Kentucky. A 2014 report on behavioral health from the Substance Abuse and Mental Health Services Administration (SAMHSA) says 69.3% of adolescents in Kentucky believe there is no major risk in smoking marijuana once per month—less than the national average of 74.7%. However, therapists in Kentucky may be concerned that this percentage increased from 60.5% in 2009 to 69.3% in 2013. According to the 2016 MHA survey, Kansas had the 9th-lowest percentage of young people with dependence on alcohol or drugs. Approximately 5.6% of children in the state have private insurance that does not provide coverage for mental health conditions. Results from the 2016 MHA survey show a significant disparity between the mental health of adolescents and the mental health of adults in Kentucky. Therapists and analysts from Mental Health America contend that 19.68% of adults in the state are affected by some type of mental health issue. Among this population of affected adults, 24.7% reported their needs were not met, 54% did not receive treatment, and 18.2% did not have insurance. Like the younger population in Kentucky, a relatively low percentage of adult residents displayed dependence on alcohol or drugs; the state was ranked 10th in this mental health measure.